Interested in Anime? You will enjoy our exclusive interview with 9-yr old Anime dance champion Sterling Williams. Did you know December marks the anniversary of the Boston Tea Party? Read a clever, creative essay about this historic event. Ever wonder about llamas? Learn from the “Llama Lady”. 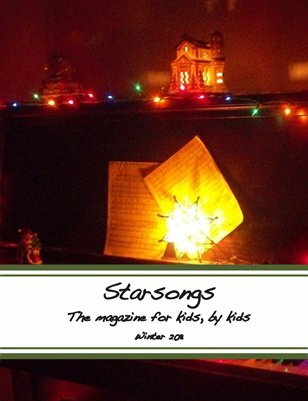 Starsongs, the magazine for kids by kids, celebrates the holiday season with an eclectic collection of original short stories, poetry, and essays.